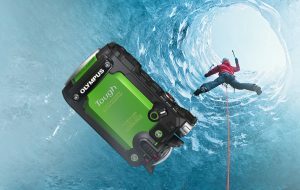 London, 24 May 2016 – Ten years after Olympus launched the Tough camera, the new TG-Tracker takes the all-action field log camera to new heights – and depths. While conventional action cameras specialise in one area but fail in others – like image quality, shot selection or battery life – the TG-Tracker excels across the board. It combines the imaging power of Olympus high-end camera technology with the portable build quality that comes with a decade of category-leading outdoor expertise. For fans of extreme sports it enables ultimate flexibility: instead of recording a rough impression of an event, they can capture an impressive record of various elements in difficult scenarios. The TG-Tracker has a detachable grip, ultra-wide angle lens, 5-axis image stabilisation and a flip-out LCD monitor – so you can easily frame and shoot blur-free, by hand, in harsh conditions. Given the TG-Tracker’s comprehensive new tracking and field logging capabilities, the result is a more gripping, higher quality way to re-live and share intense moments – like a sky or scuba dive, kite surfing jump or wild-water ride in a bucking canoe. Using the free App Olympus Image Track Ver 2.0, owners can review outdoor adventures with all the information they need to bring the physical challenge to life: altitude or depth, air or water temperature, geo-location and direction and speed of movement. The new TG-Tracker is compatible with many harnesses and mounts for all sorts of outdoor and sports equipment (adapter supplied). It is available from July 2016 for £279.99. The new TG-Tracker has what it takes to hit the ground running. 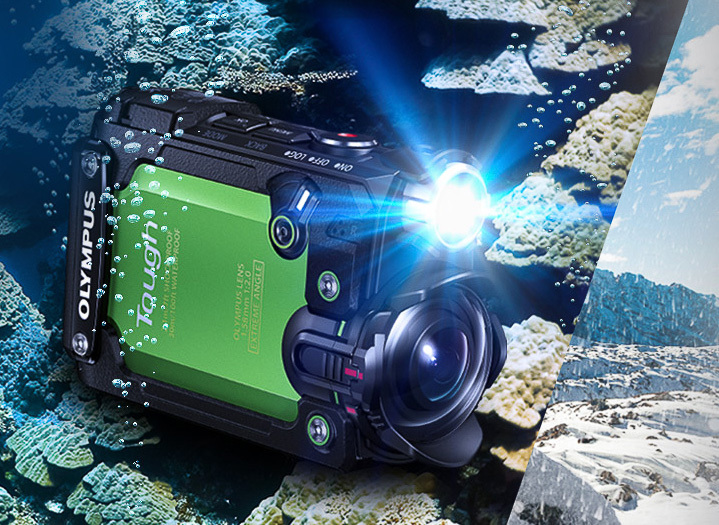 Literally, this camera is ready to record in the harshest environments without added protection. It is shockproof to a height of 2.1 metres*, crushproof to a weight of 100kg*, dustproof, freezeproof down to -10°C* and waterproof down to 30 metres* below sea level. In addition to Olympus image quality and its wide-angle, hand-held framing flexibility, it also has another dimension that makes sure it stands out among other outdoor still and video cameras: its five sensors. Unlike products with regular geotagging, the TG-Tracker can sense acceleration, altitude or depth and temperature as well as direction of movement – in addition to latitude and longitude. This gives extreme sports enthusiasts a complete picture of where they were, what was happening and how they were performing at the moment any given image was captured. For example, when they review footage on their smartphone, scuba divers can see at a glance at what depth, water temperature and distance from the entry point they encountered a spectacular fish or species of coral. The camera even logs changes in G force – like a parachute opening or the take-off and landing that bookend a snowboarder’s 360 – then tags the chapter for easy retrieval. The TG-Tracker lets owners focus on the immediate challenge and thrill, while it is capturing all the key data. By showing images and details in context in the new and free Olympus Image Track App (OI.Track) – such as where a photo was taken on a realistic depth/time profile of a scuba dive – five-sensor tracking makes re-viewing and sharing extreme activities all the more fascinating, and more intense. This isn’t just life logging. It’s energising logging of a real-life adventure. TG-Tracker owners benefit from Olympus’ high-end imaging know-how, and a camera that out-performs similarly priced rivals in many ways. From 5-axis image stabilisation for video and the performance of the replaceable battery to the flip-out colour LCD for framing and reviewing the action. What’s more, its ultra-wide lens that captures a 204° field of view that often reveals peripheral details the owner cannot even have seen. In addition the TG-Tracker records 4K video** with ease, powered by the same TruePic VII image processor found in several high-end Olympus interchangeable-lens cameras. Underwater, the camera automatically adjusts white balance and other settings, and there is an up to 60 lumen spotlight for shooting when it would otherwise be too dark. The supplied grip extension and built-in mirror mean owners can hold their camera and shoot adventurous selfies over a cliff edge or – using a compatible mount or harness – completely hands-free. Alternatively, for full-length selfies with a big group and all the gear, they can operate the camera remotely from a phone with OI.Share installed, another of Olympus’ free Apps. Reviewing footage is when the TG-Tracker really comes into its own – and the images and data recorded come vividly to life, either as high-resolution 4K video on a full-size TV or on a smartphone equipped with the new version of the free Olympus OI.Track App. Transferring stills and video** to the phone is simple, via Wi-Fi. OI.Track offers owners a variety of features and settings, but the most important is the option to browse images and related log data together, in split-screen mode. The log for each clip or still can be viewed from two perspectives: as a birds-eye map or as a chart plotting depth/altitude against time. By comparing past logs stored in the App, it’s easy to calculate distance covered, speed and other variables, which is great motivation to push the limits further next time. Like every Olympus lens and camera, the TG-Tracker comes with a free six-month warranty extension**** when registered via the MyOlympus online platform. * Waterproof according to IEC standard publication 529 IPX8. Shockproof figures equivalent to MIL Standard (Olympus test conditions). Freezeproof and crushproof according to Olympus test conditions. ** 4K videos cannot be transferred to a smartphone, but can be streamed to a TV.